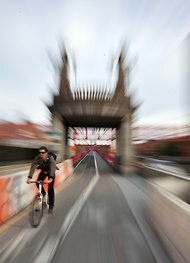 New Yorkers should love bicycling. We're control freaks. We want to get from here to there in a New York minute and moan about the subways and the buses, about lunatic taxi drivers and the gridlock that slows us down. The other day I jumped on my bicycle and rode downtown to meet Janette Sadik-Khan, transportation commissioner for New York City. She is the driving force behind the city's new bike lanes and now also a piñata for their vocal opponents. I started out along the Hudson, then headed east at 40th Street, past that nowhere stretch of depots that muscles its way toward the chaos of the Port Authority Bus Terminal. The waterfront is bucolic and almost Zen-like without a million other bikes around, but I've also come to love those gruff, empty, brooding blocks on the far West Side, which I almost never bother to walk. River gives way to industry then density, silence to the din of Midtown - a classic New York transition, an urban glory best absorbed, I have come to realize, from a bike. It's too bad that so many New Yorkers still complain about the bike lanes' contribution to the inconvenience of urban driving instead of promoting them for their obvious role in helping solve the city's transportation miseries, and for their aesthetic possibilities. I don't mean they're great to look at. I mean that for users they offer a different way of taking in the city, its streets and architecture, the fine-grained fabric of its neighborhoods. Decades ago the architects Robert Venturi and Denise Scott Brown wrote about how we see cities differently at different speeds. Las Vegas was their example, and they wrote about driving versus walking (skipping over the bicycle). But the point stands. On a bike time bends. Space expands and contracts. I've had plenty of accidents over the years and know that it may sound a little crazy to talk about meditating on urban scenery when the issue is crashing into double-parked cars, abruptly opened taxi doors and reckless riders, which is where properly designed and enforced bike lanes come in, or increasingly will, as their network grows. So far the city has installed some 260 miles of lanes during the last four years, "hard miles," Ms. Sadik-Khan puts it, meaning lanes in the densest, most contested parts of town, the ambition being to link these better and set up a bike-sharing system before Mayor Michael R. Bloomberg's term expires in two years. At the moment the lanes are disjointed, often badly marked and hardly policed, provoking antipathy and occasional chaos in the streets. Consolidating them will require a consistent, identifiable design vocabulary, a permanent architecture. This has to include more dedicated lanes, separated from automobile traffic by medians and parked cars, a feature that improves safety - as it already has along Ninth Avenue, for instance - and getting riders, drivers and pedestrians to follow the rules of the road. Cultural shifts like that take time. Bike riders especially need to follow those rules. European cities have had decades to develop cycling cultures. The Dutch and the Danes are said to be among the happiest people on earth, which I can't help but imagine must have something to do with their bike culture. You find bicycle clubs for the elderly there, clusters of teenage boys with girls perched on the backs of their bikes, commuters chatting along the bike paths, which provide a natural mix of intimacy and distance. On a bike, the city shrinks. New York is not Berlin or Amsterdam, but London has lately turned into a bike capital too, in conjunction with a traffic-congestion fee program for drivers of the sort that New York was wrong to reject recently. It's now common around Sloane Square and Piccadilly Circus to find parents with children and businessmen and businesswomen commuting on bicycles. Safety in numbers, Londoners have discovered: a city reaches a tipping point when biking achieves what Ms. Sadik-Khan describes as an everyday "architecture of safety." I looked at my watch when I arrived at 23rd Street and Ninth Avenue, where the transportation commissioner, a keen bicycler, had agreed to meet me. Including a 15-minute stop along the way, I had traveled some 4 miles in 40 minutes, or at a pace of more than 9 miles an hour. City buses average roughly 8 miles an hour, taxis, 9, during midday at this time of year. Making New York bike friendlier is of course a no-brainer for the obvious health and environmental reasons and also because cycling can be the swiftest way to get around. But it's about civic diversity as well. A half-century ago the argument to run highways through the city sounded more than a little like the case now being made against bike lanes. Critics now say that bike lanes will hurt commerce and increase car traffic congestion. Back then, it was said, cars were the path to prosperity and more rational streets. "What is now little more than a fume-filled traffic corridor will become a true neighborhood," a deputy to Robert Moses, New York's master builder during much of the last century, prophesied if the huge, multilane Lower Manhattan Expressway that Moses proposed were allowed to demolish much of what is today SoHo and the West Village. The city's very economic survival depended on accommodating automobiles and the destruction of those then-diverse areas, Moses warned. The radical-sounding rebuttal by the urban theorist and writer Jane Jacobs was that new highways only create more traffic as cars multiply to meet increased capacity. Traffic engineers today call it "induced demand." The opposite also applies. Closing streets to cars cuts traffic, as Times Square has proved. Conversely, installing more bike lanes increases the number of riders. The whole trip - about seven miles, traversed at a leisurely pace, obeying traffic signals and stopping occasionally to talk - took less than an hour. In that time an endless panorama became digestible. From Chelsea to the bird's-eye view atop the bridge and back down to street level at the Domino Sugar Factory, New York unspooled as a series of surprises.